A sharing bag of our fruit flavoured pastilles. Blackcurrant, lemon, strawberry, lime and orange flavours. Our classic, colourful, chewy sweets are great for treat time. No artificial colours, flavours or preservatives. If you're looking for a chewy, fruity-flavoured sweet, try the irresistible taste of Rowntree's® Fruit Pastilles. Every sharing bag contains a mixture of five fantastic flavours: blackcurrant, lemon, strawberry, lime, and orange. Whichever one is your favourite, every pastille promises a burst of fruity flavour. You'll never know which fruity sweet is next! These classic sweets are a great choice for treat time. And with no artificial colours, flavours or preservatives, you can feel happy to enjoy these as a fun treat. 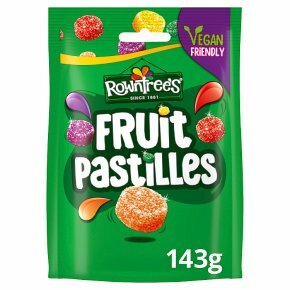 Did you know that Fruit Pastilles are the oldest sweet in the Rowntree's® family? In 1862, Henry Rowntree bought a cocoa works in York and transformed it into a confectionary company. Along with his brother, Joseph, and French confectioner August Claude Gaget, they developed the delicious taste of Rowntree's® in 1881. For more than 130 years these delicious chewy sweets have been making days more colourful with their irresistibly fruity taste and mouth-watering texture.